FoodBabe.com has some great recipes. This one, Buffalo Cauliflower Bites, is super-healthy. Cauliflower is a cruciferous vegetable and a healthy anti-cancer diet should contain several cruciferous vegetables each day! Look how yummy this looks! Food Babe definitely recommends using organic whenever possible, and I agree! Hint: If you’re trying to be healthy, try not to put pesticides in your mouth! Obviously, if you can’t find or afford organic ingredients, you can buy conventional. Just make sure to wash thoroughly and peel if possible. 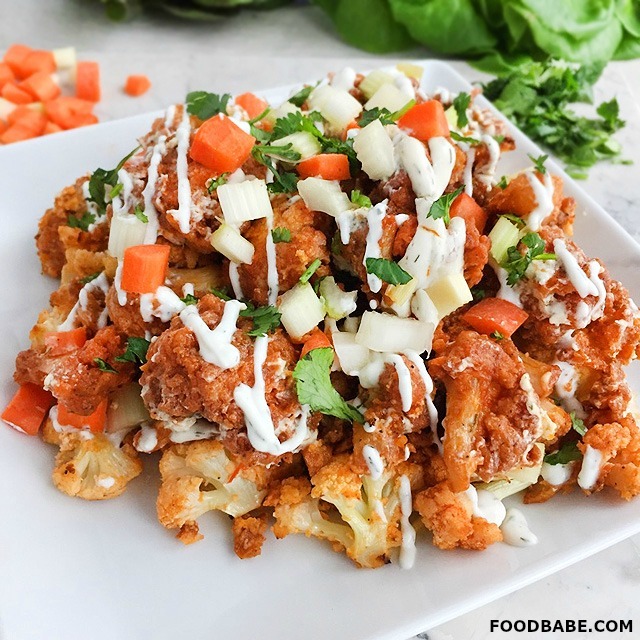 Here’s what Food Babe has to say about this recipe: “These make a great alternative to buffalo chicken wings, and I think you’ll be surprised at how hearty and delicious cauliflower can taste. Unlike buffalo wings that are almost always from factory farm chicken and packed with artificial ingredients, these are actually HEALTHY and packed with fiber and nutrients… yeah!” Click here for the full recipe! Enjoy! And be sure to check out other recipes from Foodbabe.com!